Having a good non-stick pan (Tefal) may be the easiest way to make sunny-side up-eggs, but you can also use a well-seasoned cast-iron pan or a sturdy skillet. The key to making these eggs look good is how easily they are going to slide out of the pan without tearing the yolk. 1. Melt butter in a heavy skillet and heat until hot enough to sizzle a drop of water. 2. 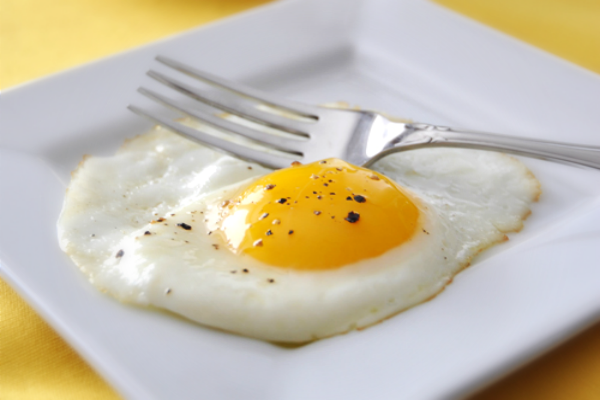 Break one egg into a saucer; carefully slip egg into skillet. Cover the pan with a glass lid, steaming the egg just a little. 3. Cook eggs over low heat until whites are firm and yolks are soft, or to desired degree of doneness; season with salt and pepper.